A cluster-randomised trial to assess the impact of a community mobilization intervention to prevent violence against women and reduce HIV risk in Kampala, Uganda. SASA! achieved important community-level impacts on attitudes and behaviours relating to violence and HIV-risk, according to this study. Importantly, intervention impacts were seen at the community level – not just among people reporting exposure to the SASA! intervention – suggesting that social diffusion worked to disseminate SASA! ideas and behaviours throughout the community. Read an interview with Professor Charlotte Watts (London School of Hygiene and Tropical Medicine) and Lori Michau (Raising Voices), discussing the study findings. Read a guest blog by Tina Musuya of CEDOVIP on Biomed Central. SASA! means ‘now!’ in Kiswahili – an appropriate name for this ground-breaking community mobilisation approach, developed by Raising Voices, to prevent violence against women and reduce HIV risk. In Kampala, Uganda, SASA! is implemented by the Centre for Domestic Violence Prevention (CEDOVIP). Take action to prevent HIV/AIDS and violence against women. SASA! takes an innovative approach to community mobilisation, seeking to change negative community attitudes, norms and behaviours, and to address the imbalance of power between women and men that underlies both risk of violence and HIV-vulnerability for women. SASA! systematically involves men, women and institutions at all levels of the community, including community activists, local government and cultural leaders, professionals such as police officers and health care providers, and institutional leaders. SASA! activities are not set rigidly, but rather develop and evolve in response to community priorities, needs and characteristics. SASA! community activists conduct activities in their own social networks, engaging families, friends, colleagues and neighbours. In this way, community members are repeatedly exposed to SASA! ideas from diverse sources and in a variety of formats and places. To see the SASA! model in action, watch this short video. SASA! is currently being used by over 30 organisations (including local and international NGOs, community-based organisations and faith-based institutions) in the Horn of Africa and in East and Southern Africa. How did the SASA! Study measure impact? Researchers conducted a cluster randomised trial in eight communities (four intervention and four control) in Kampala, Uganda. 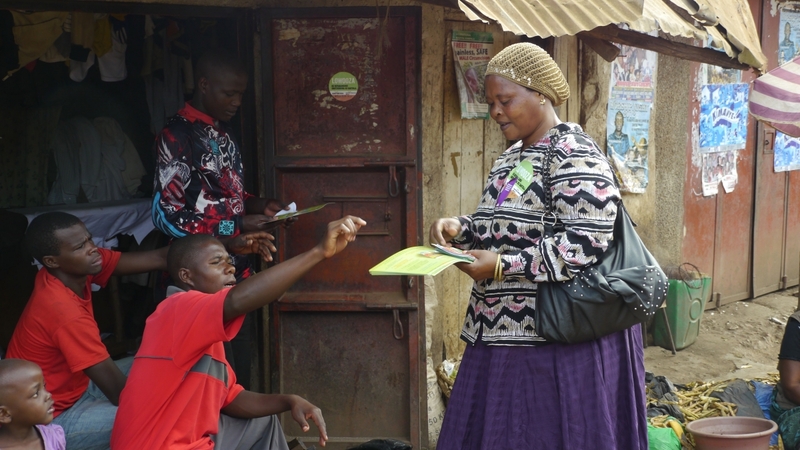 As detailed in the study protocol, they measured six violence and HIV-related primary outcomes in two cross-sectional surveys of community members, one before intervention implementation (to assess the underlying comparability of intervention and control communities), and one approximately four years later. The trial analysis compared outcomes in intervention and control communities at follow-up, and included all community members regardless of whether or not they reported any exposure to SASA! The SASA! Study is the first cluster randomised trial in sub-Saharan Africa to assess the community-level impact of a community-level violence and HIV prevention programme. SASA! achieved important community-level impacts on attitudes and behaviours relating to violence and HIV-risk. It is now being delivered in control communities and replicated in 15 countries. Future analysis will explore the costs of the intervention, the broader impacts of SASA!, and the processes of change occurring within communities.